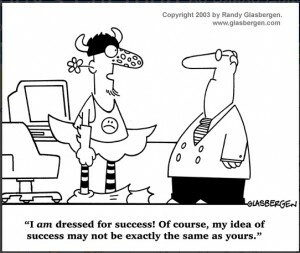 I had my chuckle of the day when a client, from the organization called S.U.C.C.E.S.S no less, sent me the above cartoon. It’s a perspective clearing question. Your aim is true and clear if you know what you value success-wise. Here are some lenses on success. Success from a Carrot Life Lens™ perspective: with a detailed, grounded, focused view, Carrots see success through a thorough, well-planned, systematic approach (systems being their 7-letter love fest). Success from a Mountain Life Lens™ perspective: with a broad, sweeping view from above, Mountains view success in terms of trends and the BIG picture. Success from a Stop Life Lens™ perspective: with a reflective, thoughtful view, Stops see success as something to be carefully considered and researched, not something to be rushed into. Success from a Go Life Lens™ perspective: with a ‘let’s try it, jump in’ approach, Gos view success in terms of a smorgasbord of opportunities – sampling things along the way and turning on a dime, changing plans at a drop if need be. Success from a Journey Life Lens™ perspective: with a ‘let’s stop and smell the roses’ approach, Journeys’ take on success is organic and iterative. The point isn’t to ‘get’ somewhere but rather to enjoy the path along the way. Success from a Destination Life Lens™ perspective: always having a goal in mind, Destinations are sure-footed when it comes to beating a path to success. They are focused and determined in reaching their goals. Success from a Heart Life Lens™ perspective: with a well-developed intuition Hearts go with their gut and intuitively know their path to success. Their success will be subjective. Success from a Head Life Lens™ perspective: with a view towards the tangible, Heads focus on checks and balances, facts and figures. Their success will be objective. Period. And you? What combination are you? How do your Life Lenses™, the lenses that affect your worldview and your perspective, also affect your take on success? *** To support Randy’s cartoons please visit his website where you’ll find his cartoons on posters, mugs, t-shirts and other fun gift items.